"A big thank you again for breeding such a wonderful dog! We adore him! Owned by Jasmine & Tim Rutherford. Western Australia. 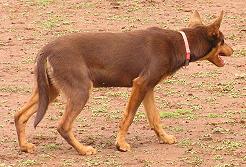 Noonbarra Jackson is a cream Kelpie. This colour is not very common but when available is extremely popular. We have been lucky to get a few lately. 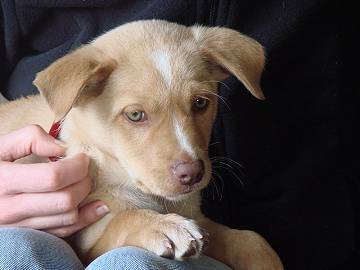 Jackson was a gorgeous puppy and went to a wonderful home where he is certain to be very loved and cared for. 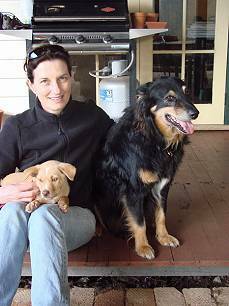 "Dear Mary and Stephen, just a brief note to let you know Jackson took the plane trip to Perth in his stride and is now busy organising our other 2 dogs. Took time off work to settle him in, but you would think he had been here for weeks. He is so bold, Tim and I just love him! 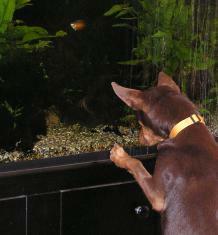 So funny to see him rounding up my other kelpie, poor Oto just doesn’t know what to make of him. The crate is such a great educational tool (and he loves it), plus your books are so helpful, thank you for suggesting them! Jackson learns so quickly. He watches Ben and Oto and mimics their behaviour; which makes it easy when they are doing the right thing! Have attached a couple of photos (yes, we have taken quite a few!) and will bore you with regular updates. We are looking forward to getting our next dog from you already! After Arrival at his new home - Jackson with Jasmine and his new friend- Ben! Tim and I wanted to drop you a note, with a couple of photos of Jackson, to tell you what a beautiful and intelligent dog he is developing into. He is rapidly becoming the alpha dog. 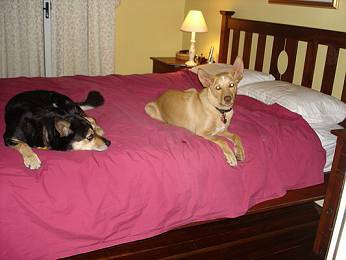 Ben (my aged collie x) seems resigned to the fact that Jackson is just too mentally strong and persistent to keep in line and my kelpie Oto is seeing this as an opportunity to elevate himself to second in charge (he is unsuccessful to date)! It’s great to see the kelpies having so much fun together, they play and argue constantly, then collapse and sleep alongside each other. They are great mates, as you can see in the photos (a little cheeky and spoilt too)! Jackson and Oto playing in the park. Jackson is trying to work Oto like a sheep. We started training Jackson on sit, heel and Noonbarra down stay at 16wks and he is so bright he picked it up within hours – amazing! 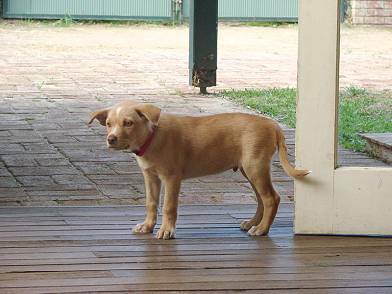 Great idea of yours to imbed the down stay into the pup at an early age – we use it all the time when Jackson’s brain clicks over to ‘puppy manic mode’ and it settles him perfectly! Our friends love him and he often gets invited to picnics and barbecues because he is so affectionate as well as being well behaved. 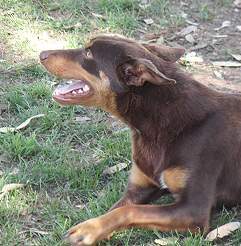 He just loves to lie about and watch people so we always get the comments about are we sure he’s a kelpie – partly to do with his cream coloring, but mainly because of his laid back attitude! 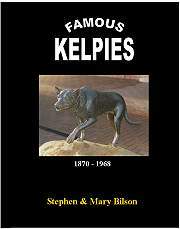 There is a lot of re-education to be done on the public perceptions of kelpie traits and Jackson is doing a great job getting people to think differently – I hope! Obedience training started in February and although it’s a good opportunity to socialize Jackson with other dogs there doesn’t seem to be a lot of work going on in class. The changes to ‘friendly training’ seem to have resulted in more talking than action. Jackson looks bored, so Tim and I have decided once he has the basics at 12mths to switch to agility to give him something more stimulating to tackle. There is also a working dog club not too far from home, so I haven’t ruled out doing some stock work with him as an alternative. We shall see what happens over the next months. Look forward to giving you another update later in the year. And, a big thank you again for breeding such a wonderful dog! We adore him! A quick note on Jackson. I spent most of today with a horse trainer from Tenterfield who was in Perth for the weekend and was helping me do some work with Jackson and my horse. Had a fantastic time, in ten minutes we had the whole problem sorted out. Just as you told me we needed two people on the job! Jackson is just getting better every day, and he is so affectionate it’s so hard not to spoil him. Tim and I are keen to get another dog from you and Stephen and are seriously considering buying Pete, if he is still for sale and if you think he would be suitable? Anyway, I will phone you, probably next weekend, and discuss this idea. Best wishes to you and Stephen. I’m thinking positive thoughts for good news and a speedy recovery for Stephen. 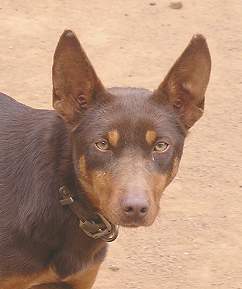 Kay was sold as an adult Kelpie to a wonderful home in Sydney. "Hi Mary and Steve, just a quick update to let you know that Kaye has settled in beautifully and for the first time I have been able to take her out off lead and she hasn't gone to run away. 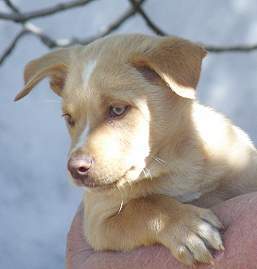 "She mixes very well with other dogs and stops wonderfully when she is told. Kaye loves running beside the bike and has begun agility in park for dogs up the road. I really think that she is a wonderful dog and a great companion. "In the evening she is allowed to come and visit for a short while in the bedroom and usually parks herself on the end of the bed but also knows that one soft clap and she is out.. I couldn’t have been happier. Looking forward to purchasing a male in the future." Kay has a very sweet nature and is a stylish and classy working dog in every sense of the word. Kay shows nice strength and courage with being too excitable or aggressive. 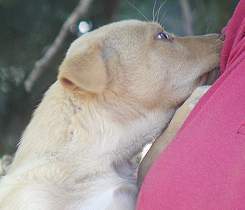 She makes an ideal companion dog and has lovely gentle and kind type of personality. She is not over excitable and loves to come up for a pat and be near us. She is easy to handle, obedient and travels well. 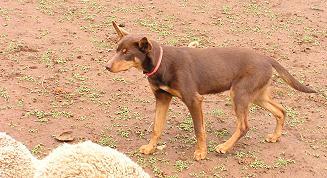 Noonbarra Kay is a gentle, lovely natured young Kelpie. She makes a wonderful companion and worker. 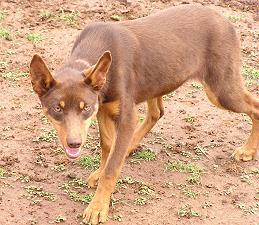 Like most Noonbarra Kelpies she has a nice faithful nature. Her sire Bonorong Rex, owned by Michael Johnson of the Milburn Stud at Cowra, is one of the top yard trialling Kelpies in the country and goes back to many generations of big Trial winners. 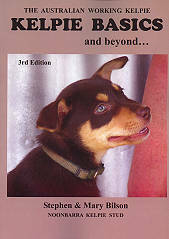 Her grandsire, Milburn Basil was also an National Australian Yard Dog Champion. 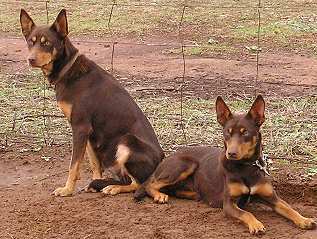 Her great Grand sire is the legendary Phils Creek Sam, who was both, Australian National Kelpie Champion as well as NSW State Champion. He won trials all around the country and made a huge reputation for himself. 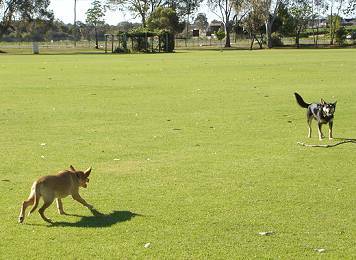 Kay's sire, Bonorong Rex has won a number of major Yard Dog Trials. Kay's mum, Noonbarra Sarah hardly needs any introduction to those who know the Noonbarra Stud. Sarah is one of our best breeders and workers and is very special due to her style of work which is very steady and smooth with nice distance and eye but very, very, powerful. No sheep ever stands up to her! Kay's working ability is very good and she has a high degree of natural inherited ability. With a few months experience on a working property, she will improve considerably.